Active resistance for a ban on fracking – worldwide! The coordinators of the WWC express their solidarity with all the anti-fracking activists taking part in „Global Frack Down Day“ on 11th October. Fracking not only destroys whole landscapes, pollutes the water we drink and the air we breathe but also is a major threat to our climate. We say ban fracking – worldwide! It only serves the profits of the big energy corporations. In the last years women and children were endangered through wars worldwide, especially in the Middle East states of Syria and Iraq, where now the Islamic-fundamentalists are committing massacres in their attempt to build up the Kalifat. All these forces like Al Kaida were in their origin built up by the imperialist forces, especially the USA. Nowadays they are financed by the income from occupied oil resources in the Iraq, and/ or supported by the governments or very rich people in Qatar, Kuwait, Saudi Arabia and Turkey. In the whole region women are oppressed by the weapon of sharia. Under this law in the name of Islam women are stoned, raped and driven out from social life in the society, work and political affairs. In Rojava, the Kurdish part in the north of Syria, the people are building up new structures of self-determination, democracy, gender equality and liberation. The so called “Islamic state” (IS), who are in reality fascists, are now attacking the city of Kobanê in Rojava, which is known as the heart of Rojava. When they sieged the city of Shengal they massacred people, raped and killed women and children. It must be prevented that this happens again in Kobanê. We coordinators of the World-Women’ Conference call upon all people to support the struggle against the IS fascists and we support the proposal for a delegation of women observers to Rojava. After the end of the world economic and financial crisis the companies are even more in competition over who will be the winner of the crisis. Therefore they dismiss many thousands of employees and increase the work rush. The governments, the Troika, IMF and World-bank shift the burden of the crisis onto the masses. We are in solidarity with all fighting workforces and especially with the women like the 595 cleaning women in Athens, who were dismissed in 2013. To the people of West Africa, especially women of Liberia, Guinea, Sierra Leone, victims of the epidemic virus of Ebola and the exclusion. We, women coordinating the World Women Conference, are expressing our solidarity and our concern about the mysterious spread of this disease and the closure of the borders, cities, houses and hearts support by the international community. We are wondering which connection the Ebola have with the creation of Commandment Africa military base of USA in Liberia? We, world women conference coordinators, express our solidarity with martyr and heroic women and people of Palestine, who have suffered once again the military imperialist aggression of Israel and associates. And we stand with them for their autonomy, self-determination and sovereignty. Trafficking of women, especially young women by organized criminal gangs is an acute problem all over the world. As a result of trafficking all these women fall victims of prostitution, forced labour and similar inhumane conditions. Therefore all women of the world are together hand and hand to fight against such criminal acts. 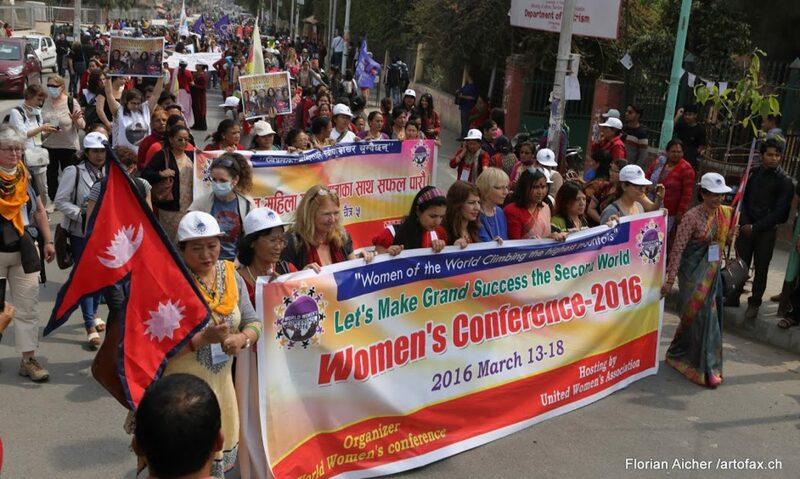 The third worldwide meeting of the coordinators for the 2nd World Women’s Conference in Nepal 2016 took place in Chemnitz / Germany. We were happy about our friendly and very engaged and competent hosts of the Chemnitz Women’s Network. We heard that their structures are being put into question because of new by-laws such as the new nomination of the representative for gender equality every five years. We support all demands of the women of Chemnitz to guarantee effective structures of work for gender equality. Thank you very much for your hospitality. Vorheriger BeitragZurück Courage: Hände weg von unserer Gemeinnützigkeit!